Technology has reached a level of maturity in which it’s possible to carry around a full-fledged computer in your pocket. While smartphones technically fall into this category, I’m more referring to tiny PCs like Intel’s Compute Stick or the Kangaroo Plus from InFocus. One of the problems with such computers is that you need to also carry around input devices like a keyboard and mouse (assuming there aren’t any where you plan to use the system). This shortcoming has led to some creative experimentation among device manufacturers. Acooo’s oneBoard PRO+ is a perfect example. Stuffed into an otherwise unassuming mechanical keyboard is a quad-core Android PC. It’s a clever concept but what if you’re extremely pressed for real estate? 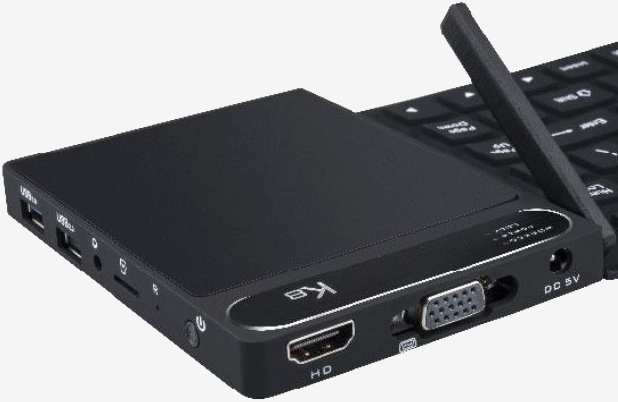 That’s where something like the Vensmile K8 mini PC comes into play. 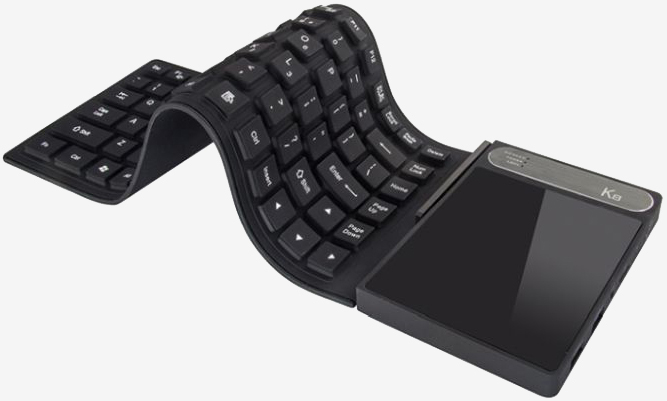 As Liliputing notes, the device hardly looks any different than the flexible, rubber-style keyboards that have been available for years. But upon closer inspection, you’ll see that there’s a solid section on the right that serves as a touchpad. The dual-purpose touchpad is also the chassis for a tiny desktop computer consisting of a quad-core Intel Atom x5-Z8300 (Cherry Trail) processor clocked at 1.44GHz (Burst to 1.84GHz), 4GB of DDR3 RAM and 64GB of eMMC flash memory. You also get dual-band Wi-Fi and Bluetooth 4.0 as well as HDMI out, VGA out, a USB 3.0 port, a USB 2.0 port, an expansion card slot and a 3.5mm headphone jack – all running Windows 10 Home. GeekBuying is now accepting pre-orders with plans to ship later this month. Expect to pay $199.99 or the opportunity. Neat idea but trying to type on that keyboard would be like trying to type on a ZX Spectrum... it would be very awkward to use. Looks neat. Would be useful for traveling presentations and such. however, if it will be running android, I'd rather see something like a nvidia tegra X1 SoC, or perhaps a snapdragon 821, with 6 or 8GB of RAM. Both of those have superior GPUs then the cherry trail chip does, and are more likely to get custom ROMs. 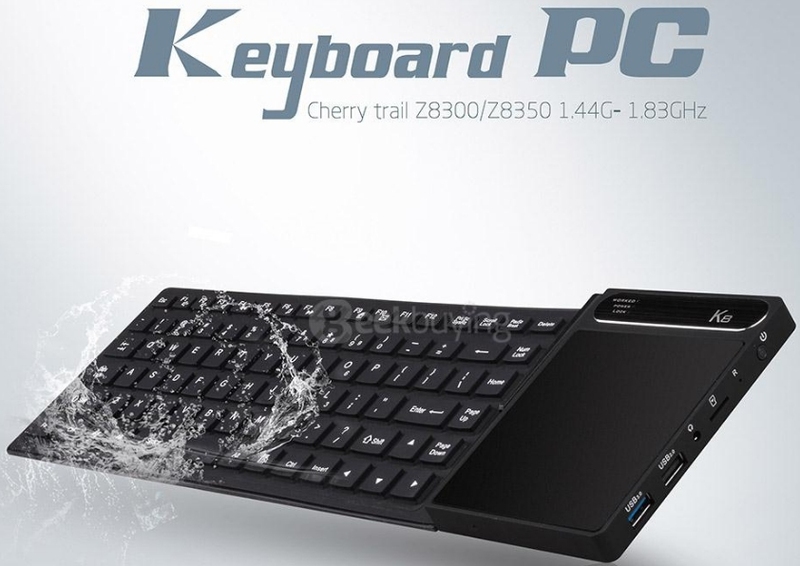 Always wondered why no one thought to build a PC into a keyboard. Now someone should take a non-flexible one and throw an i5 into it or something. It's quite natty but I'll wait until they shoehorn dual Titan's into it... for the same price. The article says, near the end, that it runs Windows 10 Home. Android was only mentioned in reference to a different device. Pretty damn neat, and it's priced rather well too. All you need to carry with you is a HDMI cable and the power adapter and you can look like a IT boss where ever you go in seconds! I'd like to put a less demanding OS on it however, Windows 10 will use up half the flash memory alone. That is pretty damn novel of them. How hot does the the trackpad get though, since it's basically the top of the mini-pc? Windows 10 in Tablets takes up less than 8GB. Oh yeah? Is that what they plan on putting on this thing? Need to look up the specs and requirement of the tablet version of Windows 10 now. Update: So after looking on Microsoft site I can't find anywhere that says it only uses 8GB of HDD space after installation on a tablet, it seems to specify 16GB as the requirements, also notes that 32GB system will have little space after. If you can find somewhere that specifically says it only uses 8GB in tablet mode that would be swell.